Galanin is an endocrin neuropeptide of 29-30 (30 in human) aa, encoded by the GAL gene. Galanin was first identified from porcine intestinal extracts in 1983 (Galanin- a novel biologically active peptide from porcine intestine, 1983) and it is widely expressed in brain, spinal cord, and gut of humans as well as other mammals. 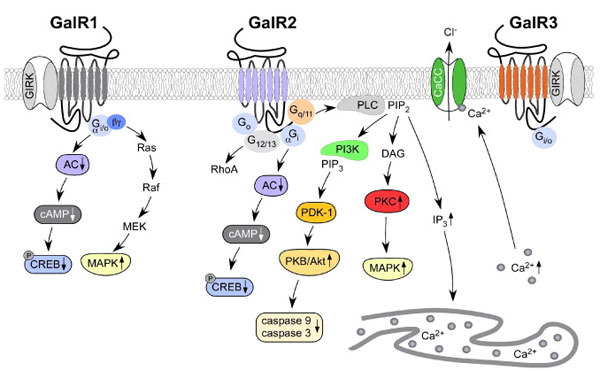 Galanin signaling occurs through three G protein-coupled receptors (GalR1, GalR2, GalR3). His best-known function is the modulation and inhibition of action potentials in neurons, predominantly is an hyperpolarizing neuropeptide. His name derives from a N-terminal glycine residue and a C-terminal alanine. The sequence of this gene is highly conserved among mammals, showing over 85% homology between rat, mouse, porcine, bovine, and human sequences. In these animal forms, the first 15 amino acids from the N-terminus are identical, but amino acids differ at several positions on the C-terminal end of the protein. These slight differences in protein structure have far-reaching implications on their function. For example, porcine and rat galanin inhibit glucose-induced insulin secretion in rats and dogs but have no effect on insulin secretion in humans. This demonstrates that it is essential to study the effects of galanin, and other regulatory peptides, in their autologous species. The mRNA encoding the Galanin is composed of a 5nt portion encoding a signal sequence, followed by a Lys-Arg cleavage site, then the 29-amino-acid-long galanin peptide followed by Gly-Lys-Arg at the C-terminal containing the amide donor Gly and the cleavage site Lys-Arg. 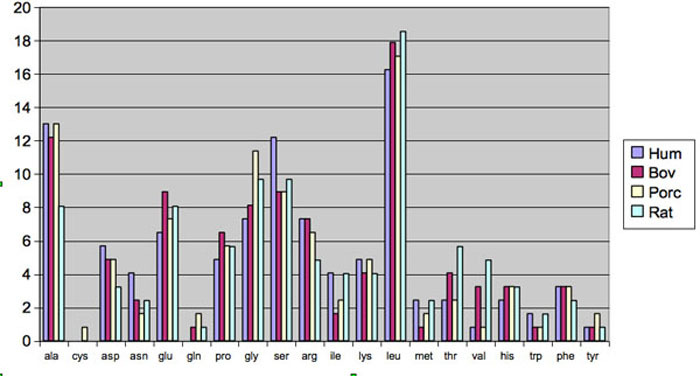 Both the signal sequence and the galanin sequence show a very high degree of homology (>85%) between the rat, mouse, porcine, bovine, and human sequences. Organization of the preprogalanin gene (modified from Kofler et al., 1996). The first exon encodes only the 5′-untranslated region of preprogalanin mRNA. Exon 2 starts with the translation initiation codon of the signal peptide and terminates before the proteolytic site preceding the mature galanin peptide. The first 13 amino acids of galanin are encoded by exon 3; the remaining 16 amino acids and most of GMAP by exons 4 and 5. The remaining portion of GMAP and the polyadenylation site are located in exon 6. Arrows indicate cleavage sites of endopeptidases. Initially was observed that Galanin and biologically active fragments such as galanin (1–16) stimulate food intake following acute central injection into the hypothalamic paraventricular, lateral and ventromedial nuclei, and the central nucleus of the amygdala, producing a rapid increase in the feeding response and total caloric intake without altering feeding-associated behaviors such as drinking, grooming, and motor activity. However, a recent detailed study of GalR1-KO mice fed diets containing differing levels of energy and fat, concluded that the endogenous galanin-GalR1 system does play a significant role in adjusting food intake and/or metabolism to acute changes in dietary fat. In response to an acute 3-day high-fat challenge, GalR1-KO mice displayed an impaired adaptation, leading to increased food intake and weight gain, compared to normal food intake and weight modulation on low-fat diets. This latter finding is consistent with the phenotype reported for the galanin-KO, which is also more sensitive to leptin treatment. In contrast to this acute response, over a subsequent 2-week period on the high-fat diet, GalR1-KO mice consumed less food and daily energy than when maintained on a low-fat diet and less food and energy than their heterozygous littermates, suggesting that overall, GalR1 may oppose positive energy balance or help maintain neutral balance. Adaptation to high-fat /high-energy diets in age-matched, adult, male GALR1 knockout (−/−; KO, n = 5), GALR1 heterozygote (+/−; hetero, n = 7), and wild-type (+/+; C57BL/6J, n = 5) mice. Data reflect mean ± S.E.M. (top) daily food intake, (middle) daily weight gain, and (bottom) feed efficiency in mice while maintained for 10 days on purified low-fat/low-energy control diet or during a 3-day “challenge” of being switched to high-fat/high-energy diet. p < 0.05 vs. respective wild-type control, #p < 0.05 vs. respective low-fat diet condition (Fisher's LSD tests). Salt loading and dehydration increase both vasopressin release and the level of galanin; the latter in turn acts as a negative feedback modulator of vasopressin release. 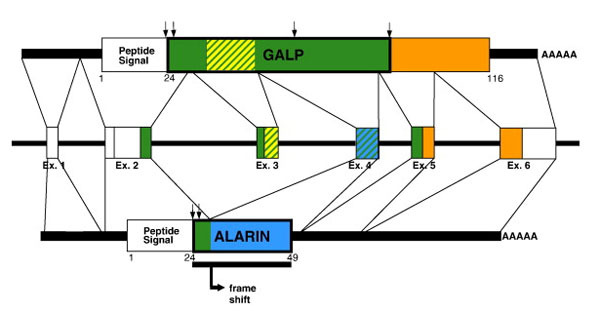 The GalR1 agonist, M617 also inhibited SFO cells, whereas the GalR2/3 agonist galanin (2–11) had no effect, suggesting that galanin responses were largely mediated by GalR1. The role of galanin in acute nociception has also been assessed in transgenic mice.. Intact adult galanin-KO mice have greater sensitivity to acute mechanical and thermal pain, while galanin-overexpressing (OE) mice have reduced responses to acute nociceptive heat. In pathological, chronic pain conditions such as neuropathic pain and inflammation, expression of galanin (and several other peptides) is markedly increased in nociceptive pathways in DRG and the spinal cord. Galanin-KO mice displayed a reduced pain response and autotomy in chronic pain models. Since galanin was originally isolated from porcine small intestine, the GI tract has subsequently been investigated extensively in an effort to uncover possible physiological functions of galanin. Galanin was found to be widely distributed throughout the digestive tract with galanin-LI present in enteric neurons and in nerve fibers projecting to all layers of the GI tract wall of all mammalian species investigated, including human. In post-mortem brains from Alzheimer's victims, an increase of galanin receptor binding sites of up to 200% was observed in several layers of the hippocampal CA1 region, the stratum radiatum of CA3, the hilus of the dentate gyrus and the substantia nigra. Increased galanin receptor expression is also evident in the central nucleus of the amygdala and the cortico-amygdaloid transition area in the early stages of Alzheimer's disease, but levels decrease towards the end-stages. (Galanin receptor over-expression within the amygdala in early Alzheimer's disease: An in vitro autoradiographic analysis, 2002) Galanin-positive fibers and terminals are present in a higher density in the basal forebrain and they hyper-innervate the remaining cholinergic cell bodies. It has been proposed that the inhibitory activity of galanin might inhibit ACh release and worsen symptoms; although more recent findings indicate otherwise. In electrophysiological studies of acutely dissociated rat cholinergic neurons from basal forebrain, galanin inhibited K+ currents, but not Ca2+ or Na+ currents. It is still unclear whether upregulation of galanin in Alzheimer's is a contributing factor to the disease, or a result of nerve injury, or a compensatory change to maintain cholinergic transmission. Galanin has been detected in pancreatic islet cells and nerves in several species. A large number of galanin-like immunoreactive cells were observed in both the peripheral and central regions of the islet of Langerhans of normal rat pancreas. In contrast, pancreatic islets in diabetic rats contained significantly less galanin-LI cells, because galanin is synthesized by insulin producing cells that are reduced in these animals. Galanin has an inhibitory effect on insulin secretion from the isolated pancreas of normal and diabetic rats and this presumably represents an autocrine action of the peptide, as galanin co-localizes with insulin. Galanin has actions at several levels in the complex regulatory circuits controlling glucose metabolism and feeding: at the hypothalamic level regulating food intake and dietary preference, and in the pancreas, regulating sympathetic nerve activity and islet cell secretion (an autocrine action). Further studies are necessary to elaborate the exact sites of action of galanin in feeding and glucose homeostasis, the relative contribution of central (e.g. hypothalamic) versus peripheral (e.g. pancreatic) galanin, and the receptor subtypes involved. In humans, galanin injection has been shown to suppress the initial postprandial rise in the plasma concentration of glucose and insulin with an unaltered glucose-stimulated insulin release (Inhibitory effect of galanin on postprandial gastrointestinal motility and gut hormone release in humans, 1989) and in a cohort of 91 children, plasma levels of galanin were found to be higher among children with insulin-dependent diabetes mellitus compared to healthy subjects. In patients with type II diabetes mellitus, therefore, a strong positive correlation of the galanin plasma concentration with glucose in the fasting state was observed in both sexes. The first evidence that the galanin peptide family might be involved in the pathophysiology of neoplasms came from studies on human tumors arising from neuroendocrine cells such as adrenal pheochromocytomas, in which increased galanin-LI was detected. Numerous studies have observed galanin-LI in human pituitary adenomas. Galanin-LI and galanin mRNA expression have also been detected in human pediatric neuroblastic tumors and in 18 out of 20 human gliomas without significant clinical relevance. Prostate carcinomas also displayed galanin binding sites as other human cancers, whereas other tumors such as renal cell carcinonoma, bladder carcinoma, Wilm's tumor, rhabdomyaosarcoma, Ewing sarcoma, Hodgkin's lymphoma and squamous epithelial carcinoma exhibited no galanin binding. Contradictory roles for galanin and its receptors in various tumors have been reported so in order to understand their function, investigations of individual galanin receptors are necessary. In head and neck squamous carcinoma cells (HNSCC) with silenced GalR1 and GalR2, is showned that reexpressed GalR1 suppresses tumor cell proliferation via Erk1/2-mediated effects on cdk inhibitors and cyclin D1. Others showed that GAal2 could induce apoptosis in neuroblastoma cells with wild-type p53, whereas GalR2 stimulated proliferation in small cell lung cancer. In this study, we investigated the role of GalR2 in HNSCC cells that have mutant p53 and do not express GalR1. Interestingly, one copy of the galanin receptor 1 (GALR1) locus on 18q is often deleted and expression is absent in some head and neck squamous cell carcinoma (HNSCC) cell lines. To determine if loss of heterozygosity and hypermethylation might silence the GalR1 gene, promoter methylation status and gene expression were assessed in a large panel of HNSCC cell lines and tumors. The expression of galanin and its receptors supports a role for galanin in tumor cell pathology via autocrine/paracrine mechanisms, with stimulating or antiproliferation actions depends on neoplasm's cell origins, with potential implications for diagnosis and treatment of cancer.